Always check with the Parts Department at a NISSAN dealer for the latest parts information. * If replacement is required contact a NISSAN dealer. Use a cloth to protect the housing. Remove the rear combination light mounting bolts. Carefully remove the gasket protector. 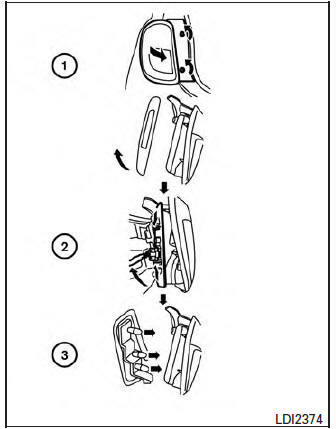 Pull rear combination light toward the rear of the vehicle and disconnect the rear combination light connector to remove the assembly. Remove bulbs by turning counterclockwise and replace with new bulbs. 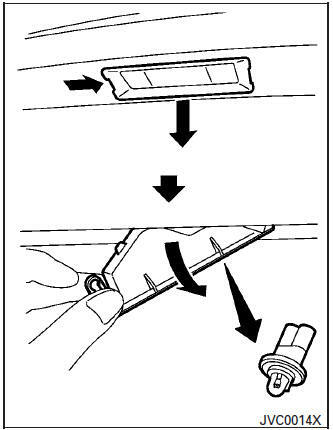 Remove the lens cover of the high-mounted stop light by inserting an appropriate remover tool between the top of the lens cover (the side not touching the glass of the rear door) and the vehicle A . Pull toward you. After the cover is removed, disconnect the harness connector and remove the highmounted stop light bulb B by rotating it counterclockwise. Replace with new bulb and reinstall cover. Remove the light A with a suitable tool. Remove the cover B .